On the anniversary of the murder of Gandhiji, it has become almost a ritual for the RSS to be reminded of what Sardar Patel had to say about the RSS’ role in the ghastly deed. With the inauguration of the “Statue of Unity” and the Sangh’s continued efforts to project Patel as one of their own, the ritual was enacted again. The Wire reminded us of the time “When Sardar Patel took on the forces of hate and banned the RSS”. The Scroll let us learn through a 2013 speech of Shivshankar Menon how “Patel worked tirelessly for communal harmony”. An essay length excerpt from Rajmohan Gandhi’s biography of Patel was also reproduced, informing us of his fairness and him being a “friend of Muslims”. In general, one is drowned in words extolling Patel’s virtues – the great unifier, the great pragmatist. This is usually accompanied by a defence against the charge of being communally prejudiced. This is in stark contrast to the sense that I get from Muslims born in the 1950s or earlier. Patel is always singled out as the communalist par excellence. Before considering the relevance of such opinions, a starting point might be to ask: What is it that makes Patel’s charges against the RSS credible? As the oft quoted communiques and letters contain very few specifics, the credibility is based on the individual’s importance, being at the centre of happenings at the time. But by the same standard, Maulana Azad’s testimony regarding Patel ought to be considered as important. It is remarkable that in showering platitudes on Patel, the Maulana’s “India Wins Freedom” is ignored not just by mainstream media, but even by those who project themselves as ‘different’. What does Maulana Azad write about Patel’s role in the events around Gandhi’s murder? Gandhiji’s decision to fast in response to the mass murder of Muslims in Delhi did not go down well with Patel and he complained that the fast “was without any justification”, and it would lead to “charges against Sardar Patel” as he was the Home Minister. Gandhiji’s response, as reported by Maulana Azad: “I am not in China now but in Delhi. … If you ask me to disbelieve the testimony of my own eyes and ears, and tell me that Muslims have no cause for complaint, I surely cannot convince you nor can you convince me …” This annoyed Patel, who responded harshly, refused to stay put in Delhi and went away in a huff to Bombay. Prior to the successful murder of Gandhiji, a bomb had been thrown at his prayer gathering. Maulana Azad holds Patel responsible arguing that his indifference to Gandhi led to the local police’s failure to take special security measures. Maulana Azad also writes that people openly accused Sardar Patel of inefficiency or worse, demanding answers. Patel’s response? “When the Congress Parliamentary Party met, he said that enemies of the Congress were trying to divide the organisation by bringing these charges against him.” This sounds eerily similar to the (in? )famous Gujarati of our own time, responding to charges of inaction or active participation in mass murder and mayhem by invoking ‘Gujarati asmita (pride)’. What does Maulana Azad say about these testing times? Apart from other remarks, he records a telling event concerning Patel which deserves to be recalled in full. “He [Patel] perhaps felt that some explanation was necessary for the attacks on Muslims which were taking place every day. He accordingly put out a theory that deadly weapons had been recovered from the Muslim quarters of the city. His insinuation was that the Muslims of Delhi had collected arms to attack the Hindus and the Sikhs, and if the Hindus and the Sikhs had not taken the first offensive, the Muslims would have destroyed them. The police recovered some arms from Karol Bagh and Sabzi Mandi. … On our arrival we found on the table dozens of kitchen knives that were rusted, pocket knives and pen knives with or without handles and iron spikes which had been recovered from the fences of old houses, and some cast iron water pipes. According to Sardar Patel, these were the weapons which the Muslims of Delhi had collected to exterminate the Hindus and the Sikhs. Lord Mountbatten took up one or two knives and said with a smile that those who had collected these materials seemed to have a wonderful idea of military tactics if they thought that the city of Delhi could be captured with them”. Far from efforts to enforce the law, this presents a man so mad with bigotry that common sense seems to elude him. If the above event took place when tempers were flared (though Indian historians would have us believe that the founding fathers stood by principles in these testing times and did not falter), Maulana Azad details another instance where even the fig leaf of an excuse would not hold. This pertains to the formation of governments after the first elections under the Government of India Act, 1935. According to the Maulana, Mr Nariman, a Parsi, being the acknowledged leader of the local Congress in Bombay was expected to be the Chief Minister “while the majority of the members in the Congress Assembly Party were Hindus. Sardar Patel and his colleagues could not reconcile themselves to such a position and felt that it would be unfair to the Hindu supporters of the Congress. … Mr B.G. Kher was brought into the picture and elected leader of the Congress Assembly Party in Bombay.” Is this the result of a “Hindu heart” that is fair? I did not say anything yesterday about the Maulana Saheb. But my objection stands. His retiring from the cabinet should not affect our connection with him. There are many positions which he can occupy in public life without any harm to any cause. Sardar is decidedly against his membership in the cabinet and so is Rajkumari. Your cabinet must be strong and effective at the present juncture. It should not be difficult to name another Muslim for the cabinet. I have destroyed the two copies you sent me yesterday. More than Patel, this lays bare a lot about the Congress Party as a whole including Gandhi, and its attitude at the first whiff of power. All the more reason for our historians to ignore these sordid chapters. 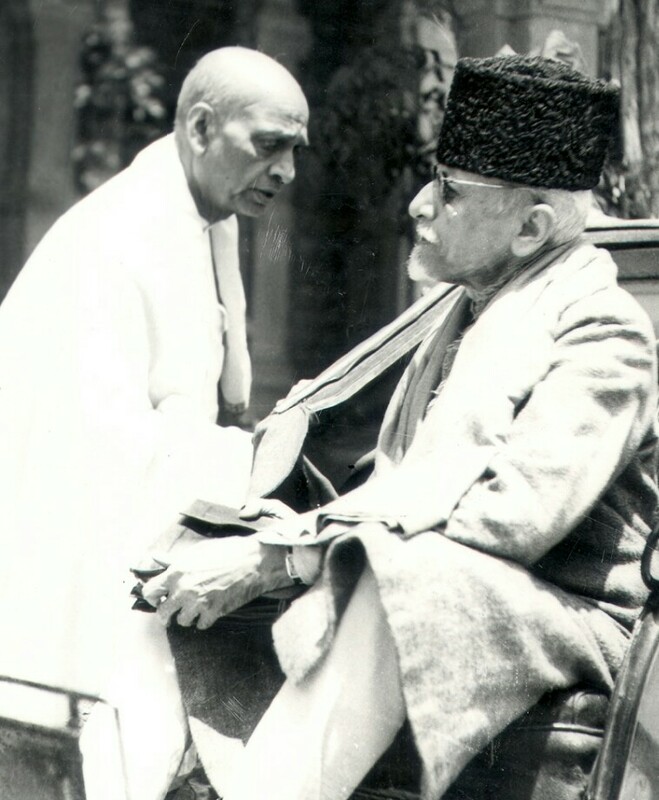 Patel’s canonisation as a leader free of communal prejudice is impossible unless Maulana Azad is utterly discredited. Therefore, it was only natural that Patel’s advocate, Rajmohan Gandhi, should have attacked the unexpurgated version of Maulana Azad’s “India Wins Freedom” through a booklet titled “India Wins Errors” in which he accused the Maulana of lying and concocting stories; that the book “does not deserve a place in libraries and reading rooms, not at any rate in shelves marked ‘history’ or ‘polities’”. Rajmohan Gandhi, in his response stuck to his view that no meeting took place and Maulana Azad had concocted the interview. On other matters, one could be charitable and consider Rajmohan Gandhi’s views to be based on his understanding of the issues which are complicated, but here is a first person testimony from a person directly involved, yet he sticks to his view castigating Azad as a liar. How charitable can one be to consider this an opinion in good faith, when eye witnesses are ignored to force through one’s interpretation? It makes one wonder about the gap between the upholders of nationalist historiography seeking to uphold the integrity of the Congress leaders in 1947 and the RSS when it comes to the position of Muslims in India. If the treatment meted out to Maulana Azad and the insistence on Patel’s fairness are any indication, the fight is not over the subjugated position that Muslims are to have in India. It is merely a contest of subtlety and over-the-top theatrics, more a fight over style, not substance. Umair Azmi holds a Masters in Engineering from the Indian Institute of Science, Bangalore and is currently pursuing a Masters in History. Poetry: In the name of Sardar, what will the “statue of unity” achieve?